Have you ever ‘hosted’ a party where all you had to do was provide your space? One of the reasons we purchased our new home was the open floor plan; we wanted a space where people could gather, and we wouldn’t feel claustrophobic. The layout of this house is great for entertaining. That in mind, when my sister asked if we could celebrate my niece’s first birthday with family at our house, I was happy to offer the use of our home, even before she told me her plans. Sharing your space is SO VERY EASY, especially when it is with people who are and laid-back (and who do most of the work). The planning is minimal. We set a time and date that worked well for both of us. My sister’s family brought in all the food, the cake, and arranged for others bring side dishes. They even brought the plates, napkins and cups so I wasn’t left with a bunch of dishes to wash. I offered to make a salad and provide the beverages and asked if it was OK to put up some simple decorations. For decorations, I just made a simple birthday banner (because ALL birthday girls need a banner in their honor) from scrapbook paper and twine, and hung a few paper lanterns in the windows. I was amazed with how easy my sister’s family made hosting here look. If you are thinking of a food idea so you can host somewhere else, a taco bar is a great idea; easy to prepare, inexpensive, easily portable, and needs little prep to do on-site. From the time they brought everything into the house, it took 15 minutes to prep to serve the meal. Not only did they bring all the food, but they brought the cake. And seriously… just LOOK. At. This. Cake! 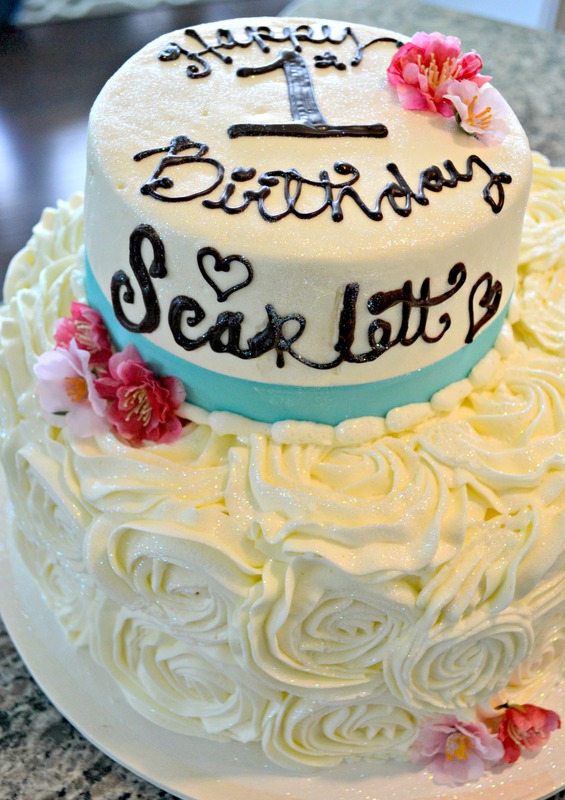 It was made by the Buttercream Bakery in St. Paul, MN. It had edible glitter, and the best buttercream frosting you’ve ever had. It was absolutely as delicious as it was stunning! After watching my niece smash her cake to bits, clapping frosting all over her face, and watching my children ‘HELP’ her open her gifts (aka…in her face and doing it for her…her parents are very gracious), all that we were left with to clean-up were a few serving dishes, and some garbage bags to take to the garage. (Oh, and some crumbs and stray blobs of frosting, which somehow only landed on the floor. My niece has impeccable aim). 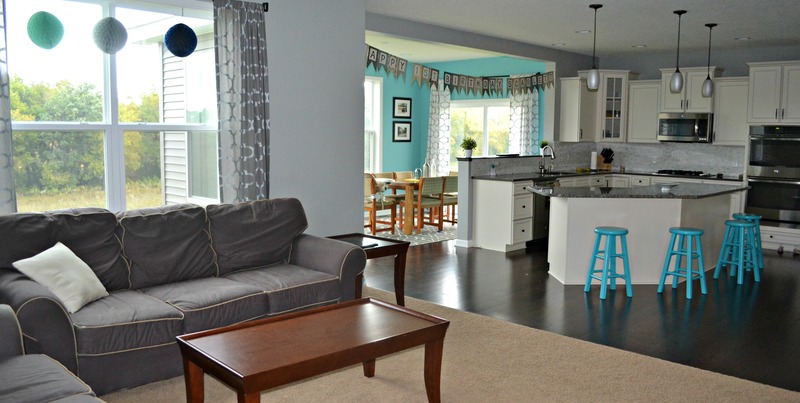 So if someone asks you to share your home so they can host a party, say YES! By offering your home, you save the host from having to clean theirs, AND you get to enjoy the party at your house, where you can put your kids down for a nap or distract with their own toys when they get bored.